The Duluth Forge zero clearance arched style ventless fireplace insert features a beautiful ceramic brick liner with dancing yellow flames and five hand painted ceramic fiber logs. 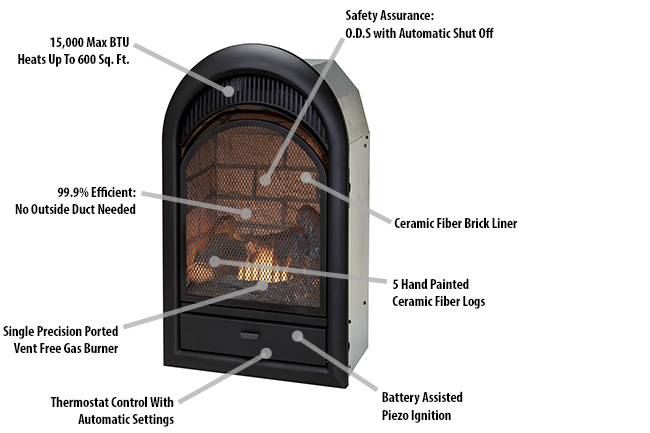 Using patented dual fuel technology, this gas fireplace insert can operate using either Natural Gas or Liquid Propane and provides 15,000 BTU of heat, enough to heat 600 square feet of space. The fireplace insert is designed as a zero clearance firebox which allows for custom built-in installations making any installation easy and the stylish arch design is perfect for your living room, kitchen or den.